There's just something about food on a stick that makes the the experience of eating that much more fun. Maybe it's the nostalgia we feel for carnivals or boardwalk food when we were younger, or maybe it's a nice reminder of times when we've gone to festivals during the summer. Either way you cut it, these cute and adorable foods on a stick will get you through breakfast, lunch, dinner, and dessert. Skewers aren't just for kebabs anymore! 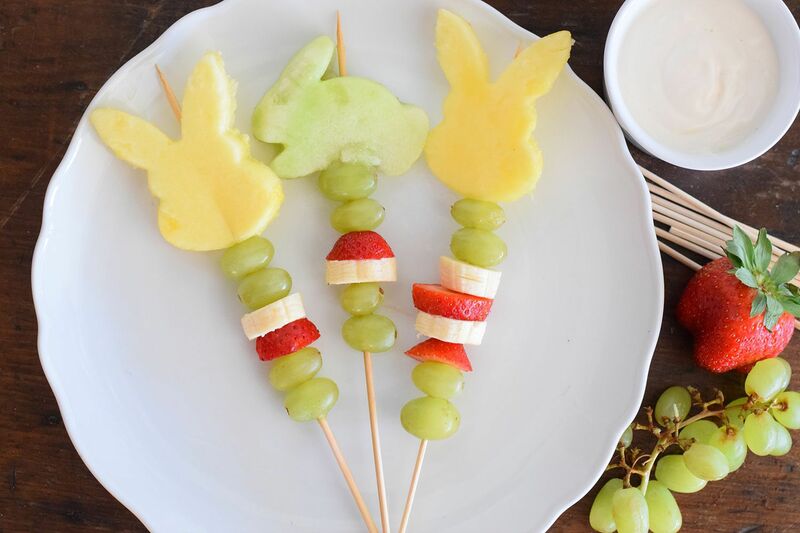 Adorable fruit kebabs are just what you or your child needs to cheer up your breakfast plate. Try cutting out different shapes from melon and pineapple with different cookie cutters based on your child's favorite shapes or animals. Or, make it holiday themed with fun cookie shapes based off of the holiday or season. Mix up the fruit depending on what looks good and is in season. The vanilla and lime yogurt dip makes them a little fancy! Yogurt, honey, and pistachio popsicles could not be easier or healthier. Low in sugar, but full of flavor, they're creamy, yet refreshing and they use fat-free plain or vanilla yogurt so they're super low in calories and fat. We recommend whipping these together on a hot, summer afternoon to help you cool off. Healthy banana splits? Yes, please! Pineapple, banana, and strawberry come together to complete this delicious take on this traditional, all-American classic dessert. 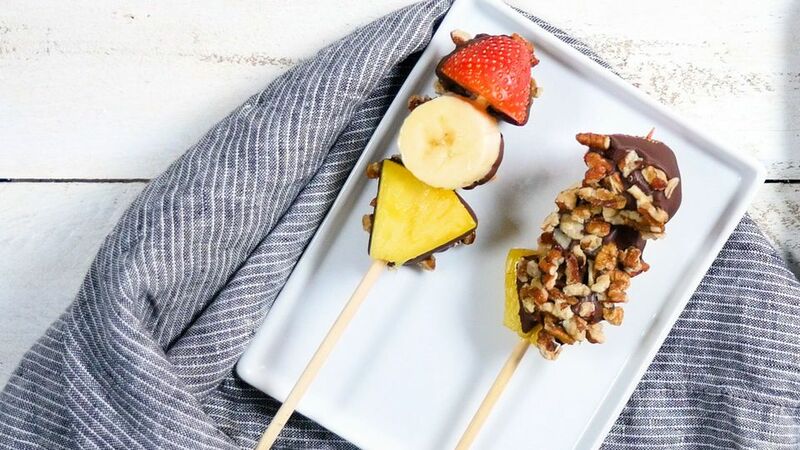 These adorable banana splits on a stick are dipped in chocolate and nuts. You can eat them on their own, or you can serve them with a heaping bowl of ice cream for a full dessert experience. They are so easy to make them ahead of time and keep well either chilled or frozen for whenever you are ready to eat! Moving from the more dessert focused recipes to the savory side of things, these crispy, crunchy prawn rolls are skewered and deep fried three at a time on wooden sticks. You won't be able to stop popping them in your mouth! Try them with a sweet dipping sauce. Not interested in prawns? You can also try skewering little spring rolls or egg rolls! Yum! What's a more iconic food on a stick than corn dogs? We can't think of anything. Make these delicious little mini versions using mini hot dogs and large tooth picks. Sweet, savory, salty, crunchy, and soft, there's a reason why they are so popular. Bring home the classic carnival treat! Hot chocolate on a stick? You bet! They can be eaten on their own as candy fudge or added to a large cup of hot milk to make the perfect cup of hot chocolate. You can also use them for delectable winter hot chocolate bars. Just make sure to serve them with plenty of marshmallows, of course! These little pancake skewers are the perfect brunch treat. They look so pretty and sophisticated on a brunch table, especially for a baby or bridal shower. They are also a great little breakfast to put together with the kids! Strawberry and banana are skewered together with teeny little pancakes and delicious Nutella can be spread or drizzled all over them. What could be better? Put your favorite lunch-time sandwich on a stick. These candy cake pops are bursting with peanut butter and jelly and are coated in decadent chocolate. They actually use little jelly filled doughnut holes, so they're super simple to make and require limited ingredients. You probably already have all of the ingredients on hand. Our recommendation? Try crunchy peanut butter instead of smooth and use dark or milk chocolate for the coating. So. Good. Eating pie off a stick is a great way to eat pie. It's fairly mess free and no fork is needed. Try making them ahead of time, then freeze them, and pop them in the oven when you're ready. They are great warm with ice cream or room temperature on their own. Switch up the fillings and the tiny cutouts depending on the season and what is fresh. Peach is perfect in the summer and pumpkin is ideal in the fall! Sweet and crunchy popcorn balls are super fun to eat (and make) when they're on a stick. And they are of course, delicious. You can go the traditional route with a simple caramel popcorn ball or add dried fruit and nuts for something a little different. Try different colors for Halloween or other holidays! If you're looking for a heftier portion, you make it for a fun take on dinner. Just grill or bake them. These delicious meringue pops look very impressive, but don't let that fool you into thinking they are too complicated to make. No, they are actually fairly simple. Full of chocolate and a light rose scented flavor, they are crunchy and creamy at the same time and look gorgeous skewered on pretty striped sticks!